Manfred Knaak’s version of The Planets presented here was created in 2017 and commissioned by the Nicolaus Copernicus Planetarium in Nuremberg and the ensemble KONTRASTE. The name ”ensemble KONTRASTE electric band” is a reference to the famous ”electric bands” of the 1980s, such as the ”Chick Corea Electric Band”, harkening back to a time when ever more musicians were discovering the increasing creative possibilities of synthesised sound generation. As with Chick Corea, the band is made up of a combination of traditional classical, electronically amplified and computer-assisted instruments (EWI = Electronic Wind Instrument, electric guitar, electric bass, cello, keyboards and drums). 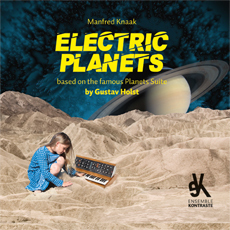 The direct reproduction of Holst’s score for the electric band, the improvisation, the generous use of electronic programming, with all of its unique possibilities, and last but not least, The Planets are sometimes given entirely ”new clothes”. Electric Planets can be seen as an adaptation of Gustav Holst’s famous work in a very particular idiom, influenced by the crossover between classical and modern electronic music, together with elements of impressionism and jazz.